For most of its existence, the Artisan Distilling Program that Professor Kris Berglund founded in 1996 has been one of Michigan State University’s best-kept secrets. When asked in May of last year whether his goal was to make MSU the kind of research-and-education champion for alcoholic-spirit makers that University of California at Davis has long been for domestic wine producers, Berglund said, “To people in the industry, we already are.” Yet few in the broader MSU community had any idea the program even existed. With the support of university officials, Berglund is now undertaking a major effort to open the doors of the Artisan Distilling Program to the university community and the general public. In early July, Berglund opened a tasting room at the program’s distillery, about two miles from the MSU campus. The teaching and research side of the Artisan Distilling Program — the part that the university administers and runs — is playing a lead role in a major new embellishment of Michigan State’s investment in beverage technology. The university has authorized the creation of a new minor that will allow students to specialize in production of spirits, wine and beer. This is a move that almost surely will increase the volume of laments Berglund often hears from alumni: the program’s existence is proof that they were born too soon. Many of them are kidding, or kidding themselves, though, as only the most scientifically adept students will qualify for the program, a joint project of the departments of chemical engineering, food science, chemistry, microbiology, and biosystems engineering. Current plans only allow for students majoring in these disciplines will be accepted into the program, and virtually all will be upperclassmen, given that all participants must have reached the legal drinking age of 21 to participate. Titled the Beverage Science and Technology specialization, the program is currently slated to feature five classes, all of which most be completed successfully in order to qualify for the full minor subject status. The classes are Beverage Science and Technology Microbiology, Wine and Vines, Fermented Beverages, Technology of Wine Production, and Brewing and Distilled Beverage Technology. The tasting room, meanwhile, is operated under a longstanding commercial licensing agreement the program has with Uncle John’s Cider Mill and Winery, located about 20 miles north, in the town of St. John’s. The license allows the program to bottle the line of spirits — whiskey, gin, vodka, and brandy — served and sold at the bar under the Red Cedar Spirits label. Barred by law from producing spirits on MSU’s campus, the program until 2012 had operated in a variety of rented spaces. The latest site was the Michigan Brewing Company in Williamston, about a dozen miles east. But with the financially troubled craft brewery stumbling toward foreclosure, Berglund and his wife, Dianne Holman, purchased the defunct East Lansing public works facility that now houses the Artisan Distilling Program. They also bought Working Bugs, a company owned by the couple that uses fermentation processes to make products for the chemical, agricultural, food, personal care, and health industries. With the program’s improved proximity to the core MSU community, Berglund is hoping to ramp up the tasting room’s business during the upcoming football season. He is plotting a twin set of mint and plain vodkas to play off the school colors of green and white. One can only imagine the initial reaction of MSU administrators when Berglund approached them in 1996 with a novel proposal: to purchase a still and offer courses teaching students how to make alcoholic beverages. However, once officials’ skepticism eased, they approved a decision to add distillation to the school’s course offerings, and he has maintained support from the administration ever since. The program was launched shortly after Michigan lawmakers liberalized a longstanding law that included a $10,000 licensing fee, so expensive for prospective startups that it functioned as a virtual ban on spirits making. The new law dramatically lowered that entry fee, but at the time only to allow the production of brandies made from the state’s abundant fruit crops. Berglund was one of the co-authors of a 1990 study examining the prospects for a distillery at MSU and determined that it did not make sense under the stringent laws in place at the time. But six years later, with more relaxed laws in place, Berglund and others at MSU met with state agricultural officials and fruit growers and determined the time was right. While Berglund describes himself as a beneficiary of the 1996 law change, he was active in the efforts to persuade the state legislature to facilitate production of a full range of alcoholic beverages by lowering the licensing fee to just $150. That culminated in 2008 with the current law that allowed Michigan to ride a national wave of interest in craft distilled products. In the short period since, Michigan’s original distilleries have been joined by well-regarded spirit makers like the distilling arm of the New Holland craft brewery in Holland, Mich., Grand Traverse in northwest Michigan and Journeyman Distillery near the southwest border with Indiana. In the interim, Berglund struck a commercial licensing agreement with Uncle John’s, the first benefit of which was to allow him to provide consulting services to commercial distillers. He has helped on research projects for some of the nation’s largest distilleries, including Jim Beam, the big Kentucky bourbon maker. He has also helped a number of start-up micro-distilleries get off the ground. There is sort of a Catch-22 in federal laws for distilled spirits: you need a fully functioning and licensed distilling plant to get federal permission to produce and sell hard liquor, but it is very expensive for a start-up to build their own on spec. 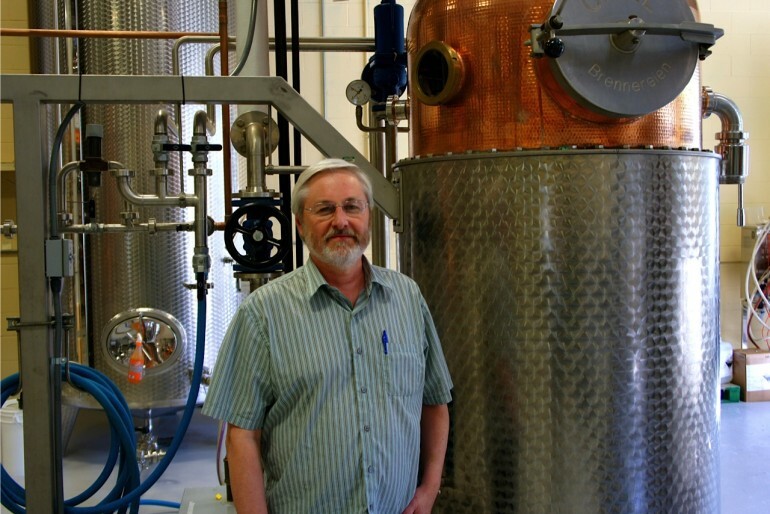 Berglund has helped by using the stills at MSU to produce samples for liquor entrepreneurs to present to potential investors, and he has even done some early commercial production for new distilleries while they build up their own facilities. While earning and keeping the support of the MSU brass has been no small achievement, Berglund may have pulled off an even bigger feat in building multi-disciplinary support for the new minor in beverage making. Three of MSU’s constituent colleges — Natural Sciences, Agriculture and Natural Resources, and Engineering — are involved in developing and carrying out the required courses. Berglund is confident that the minor will be highly popular among technically qualified students, especially those who foresee career opportunities in the fast-growing fields of adult beverage making.